While Sirajul Habib, an American youth and follower of Islam, was in Berlin, the seed of a pilgrimage to the Auschwitz Concentration Camps in Poland was planted inside him. In recent years in order to shed light on their hellish Nazi past (described as the “darkest and most horrific chapter of German history” by one of the ex-Chancellors), German governments have decided to display recovered documents and photographs from that era to the public. Accordingly, a museum, appropriately named Topographie des Terrors (Topography of Terror), had been erected to showcase them at the very site that once served as the nerve center of the “two hands” of the evil Nazi machinery, the Gestapo and the SS. While visiting the museum and walking alongside various displays inside glass cases, Sirajul was drawn to the facsimile of a yellow document written in German with a few lines in the middle of the page underlined in red. A young volunteer explained to him that the page was a part of a report that was prepared for Hitler at the end of the infamous Wannsee Conference attended by top Nazi leadership. That underlined portion specifically suggested the complete annihilation of the Jews. Among the displays was a facsimile of another document: the original estimate, country by country, of Adolf Eichmann’s—a top confidante of Hitler—murdering a total of eleven millions of Jews. As events unfolded during the Second World War, an estimated six million Jews were murdered in various concentration camps throughout Europe, a historical tragedy known as the Holocaust. It should be noted that along with the Jews, Poles, Russians, Gypsies, homosexuals and whoever was identified as “enemies of the State” were also murdered in the Holocaust. The concentration camps, especially at Auschwitz in Poland, became synonymous with the concept of “Hell on Earth” where humanity’s worst atrocities took place. The images of the above two documents started to haunt Sirajul until the day he decided to pay a pilgrimage to Auschwitz. Thus, during his next visit to Europe, Sirajul took an overnight train from Prague, Czech Republic, to travel to Krakow, Poland. The Holocaust sites are about 65 – 70 km from Krakow, so he joined a group trip arranged by the management of the hotel where he was staying. The journey by car took a little over an hour to arrive at the entrance of the first complex, known as Auschwitz I, the first site of the atrocities. Historically, the site, along with a few barracks, belonged to the Polish Army. After defeating Poland in the beginning of the Second World War, Germany seized the complex to utilize the area as military facilities and prisoners’ camps, and subsequently to convert a part of the facility as the original murder camps. 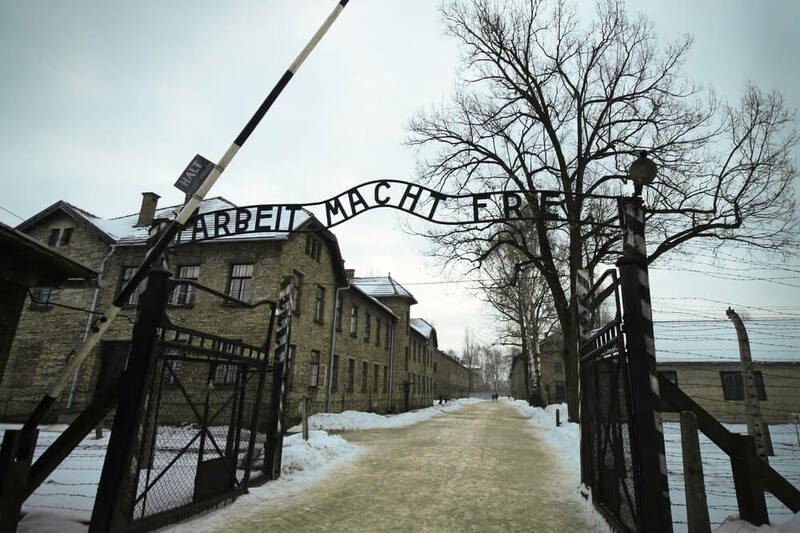 After entering Auschwitz I through the gate bearing the iconic German sign “Arbeit marcht frei” (“Work will set you free,” in English, a sign that deceived the prisoners into thinking it meant job opportunities), Sirajul’s group arrived in a courtyard with rows of buildings on both sides of the road. At the end of the road, the boundary was secured first by a barbed-wire fence, and a few meters away by a secondary concrete fence that deterred prisoners from trying to escape. While some of the buildings were utilized as administrative buildings, some of them also held prisoners. In fact, guard watchtowers were erected throughout the complex. As part of the tour, guides led the group into a building where the first generation of the gas chambers was created and utilized. The prisoners were packed into the room and the pellets of a chemical, known as Zyklon B, were dropped through an opening in the roof and then the opening closed. Upon interacting with atmospheric moisture, the pellets released poisonous cyanide gas to incapacitate the prisoners, which was then followed by their deaths. In one of the buildings, various glass showcases displayed the items left behind by the victims; for example, suitcases they were allowed to carry and eye-glasses they wore as well as Jewish prayer shawls. As the war progressed, the decision of the “complete annihilation of the Jews” made at the Wannsee Conference in January 1942 was authorized. More Jewish prisoners started to arrive, which created logistical problems for the Nazi management at Auschwitz I. Thus, a new prison site with additional prison camps, gas chambers and crematoriums were created a short distance away, extending the scope of the whole operation. This site came to be known as Auschwitz II – Birkenau. After visiting the crematorium area in Camp I, Sirajul walked towards Camp II. He entered Auschwitz II – Birkenau through a gate near the iconic tower-like main gate. Then, walking on a path running parallel to the original train track that was used to bring the prisoners in boxed rail cars, he arrived at the area of the complex where the passengers disembarked. After witnessing the horrible crimes that had taken place in the complex, Sirajul took a somber, panoramic look at the entrance behind him, and then looking above at an overcast sky with dark clouds, he felt as if time had completely stopped. While walking inside Camp II, with its overwhelming size, the barb-wired fence, and the guard watchtowers, Sirajul was overcome by the enormity and scope of Nazi evil. That fact was further proven by the scattered remnants of prison camps, gas chambers and crematoriums throughout the complex, which were destroyed by the fleeing Nazis to hide their atrocities from the rest of the world. A few of the intact prisoners’ camps were open to the visitors to get an impression of the living conditions that existed there. Sirajul walked through a couple of them to see for himself the primitive living conditions and sleeping arrangements. While wandering on the ground of this hellish place, Sirajul thought about the extreme human evil that caused the deaths of millions of innocent lives, and this realization began to disturbed him. He looked around and realized that other members of the group were also going through the same thought process, one that created a visual image of an unbearable sound of silence. He also ruminated how the expression “Never Again” failed again and again in modern times in Sudan, Bosnia, Rwanda and many other places where genocides played out while the rest of the world watched. However, Sirajul feels grateful to have finally visited Auschwitz to honor the millions of fallen victims of the Holocaust. A PhD-level scientist, Sankar Chatterjee possesses the passion for traveling worldwide to immerse himself in new cultures and customs to discover the forgotten history of the societies while attempting to find the common thread that connects the humanity as a whole for its continuity. His most recent (2016 - 17) essays appeared in The Vignette Review, Wilderness House Literary Review, The Missing Slate, Scarlet Leaf Review, The Drabble, Funny in Five Hundred, Friday Flash Fiction, Ad Hoc Fiction, Subtle Fiction, Quail Bell Magazine, Travelmag - The Independent Spirit, Three Drops from a Cauldron, and in DEFY! anthology (Robocup Press). Read more articles by Sankar Chatterjee. All original work attributed to Sankar Chatterjee © 2017 Sankar Chatterjee.